Fourteen people are dead and over 100 others are injured. 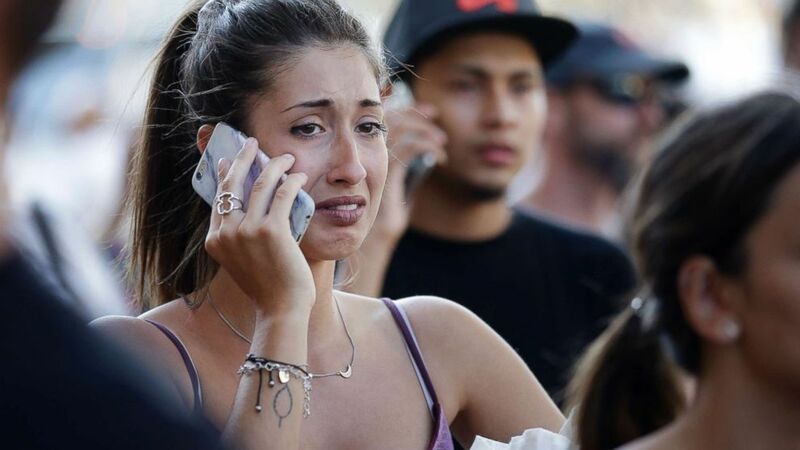 Fourteen people are dead, including one American, and more than 100 others are injured following a series of terror attacks in Spain. Police have linked four events in Spain to the same group of individuals: a home explosion in the town of Alcanar; a driver who mowed down pedestrians in Barcelona; an attack in the coastal town of Cambrils; and an abandoned vehicle that was recovered by police. Five suspects are dead and four people have been detained in connection with the attacks, police said. U.S. Secretary of State Rex Tillerson this morning announced that one American was among the dead. "We express our deepest love and sympathy to the loved ones of this individual and obviously to others who have suffered loss of life," he said. He added, "We offer our thoughts and prayers to their families as they're going to be dealing with very very tough few days ahead of them." Spain is now holding three national days of mourning. 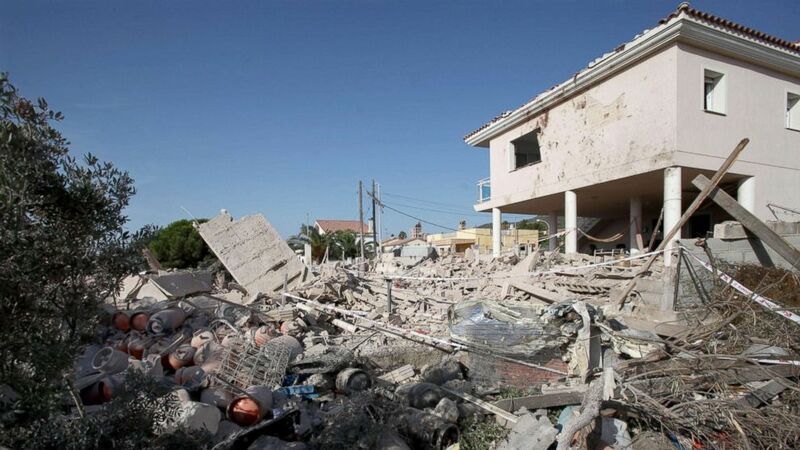 On Wednesday a house exploded in Alcanar, a town about 200 kilometers from Barcelona, killing one person, injuring others and causing part of the building to collapse. (Jaume Sellart/EPA) The debris of a house after it collapsed last night due to a gas leak explosion in the village of Alcanar, Catalonia, northeastern Spain, Aug. 17, 2017. Catalonian Police believe the explosion was connected to the attack in Barcelona. 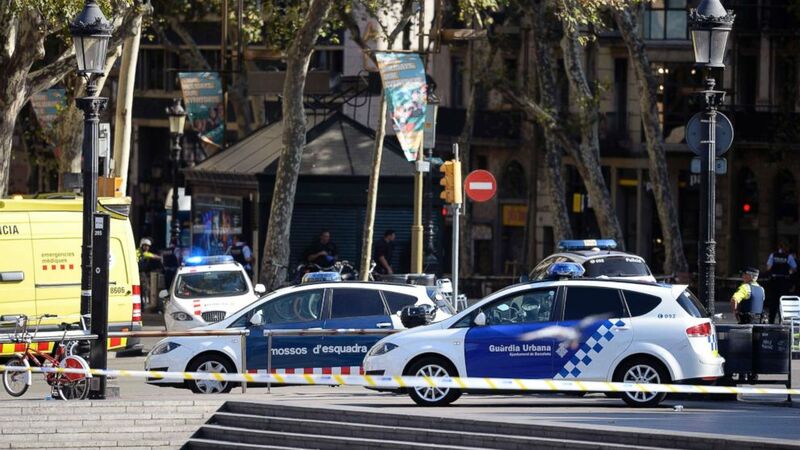 On Thursday, 13 people were killed and more than 100 were injured when a driver in a white van mowed down pedestrians on La Rambla, a Barcelona boulevard popular with tourists and locals. (Manu Fernandez/AP) People use their cell phones on a street in Barcelona, Spain, Aug. 17, 2017, following an attack by a van which struck pedestrians on a busy downtown street. Brendon Sissing, a tourist who witnessed the attack, told ABC News he heard screams of people to his left, and when he looked up, he saw a van driving at what he estimated to be 50 to 60 miles per hour. The van knocked people over, and some people were under the van, but the driver "just kept going," Sissing said. The driver stopped opposite to where Sissing was standing, he said, and then kept driving. (David Ramos/Getty Images) A damaged van, believed to be the one used in the attack, is surrounded by police officers in the Las Ramblas area, Aug. 17, 2017 in Barcelona, Spain. Witness Alec Rugo said when he saw "stampede of people" running toward him. He said he "ran with the crowd" until he found a place to take cover. "I had no idea what was happening, I just saw people running and screaming, and saw this one girl with a huge gash on her leg," Rugo said. "It was something out of a movie scene." The driver eventually abandoned the car and ran, police said. ISIS has claimed responsibility for the Barcelona attack. 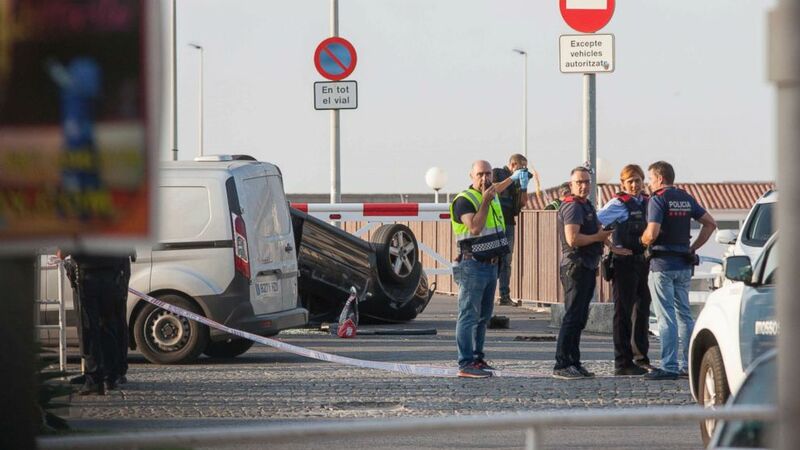 Hours after the Barcelona attack, one person died and several others were injured when five suspects, armed with knives and fake suicide vests, tried to run people down in an Audi A3 in Cambrils, a coastal resort town about 140 kilometers from Barcelona. (Tjerk Van Der Meulen/dpa Photo via Newscom) Police officers speaking next to a rolled over car at the location where police shot dead five terrorists in Cambrils, Spain, Aug. 18, 2017. The car hit several people, and one woman was killed. A police officer was also injured. The five attackers died from a shootout with police. Authorities said the phony suicide vests were only determined to be fake after a controlled explosion. Police said they believe these incidents, including an abandoned vehicle that was recovered, are all connected to the same group of people. Police say the attacks were planned for some time in Alcanar, and they could have been much worse. Josep Lluis Trapero, a senior police official with regional Catalan police, implied that the explosives that demolished the house would have likely been used in an attack. Trapero said the attackers may have been planning at least one more attack. Trapero said today police have still not conclusively identified the driver of the van in the Barcelona attack, who is believed to be at-large, but he added that one of the five attackers in Cambrils could be the Barcelona driver. (Josep Lago/AFP/Getty Images) Policemen stand next to vehicles in a cordoned off area after a van ploughed into the crowd, injuring several persons on the Rambla in Barcelona, Aug. 17, 2017. 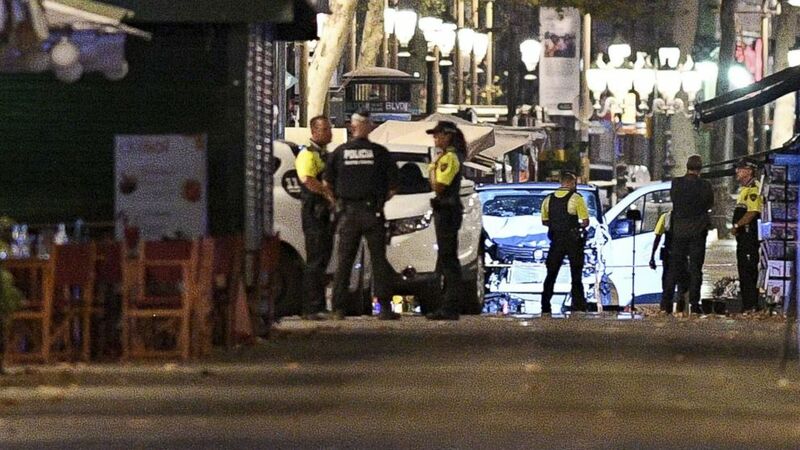 Officials say the Barcelona van was rented in the name of 28-year-old Moroccan-born Driss Oukabir, who was taken into custody within hours of the attack. Oukabir claimed his license had been stolen. Multiple Spanish law enforcement sources told ABC News Driss has been released, and the investigation is now focused on his younger brother as the possible driver. Police have already identified three of the Cambrils attackers and say they hope to identify the others soon. So far those identified have no known ties to terror, but do have criminal records, police said.